Immanuel Kant shook the foundations of Western philosophy in the late eighteenth and early nineteenth centuries. This author and professor did his most important writing between 1781 and 1790 while working at the University of Königsberg, where he spent most of his life. Kant's philosophical model not only swept aside the ideas of the so-called empiricists and rationalists who came before him, it also had a lasting effect outside of philosophy, especially in the areas of ethics and the law. Today, legal scholars still debate his ideas—and their sometimes startling implications—in relation to contemporary issues. Kant was born into a lower-middle-class family in East Prussia in 1724. A gifted student, he studied in a Latin school from age eight until age sixteen, when he entered the University of Königsberg to take up theology, natural science, and philosophy. The death of his father forced him to abandon his studies in order to work as a private tutor, and he had to wait several years before returning to complete his education. By that time he was already writing serious books. From what is called Kant's precritical period, these early works are primarily scientific. In recognition of his talents, the university made him a lecturer and eventually a professor. He taught logic and metaphysics. Twenty years later Kant attacked the reigning schools of thought. In this so-called critical period, he wrote his most famous book, The Critique of Pure Reason (1781). Kant's work examined the relation of experience and perception: he was concerned with how people know what they know, and just as important, the proper uses of the powers of reasoning. He argued that reality can be perceived only to the extent that it complies with the aptitude of the mind that is doing the perceiving. This places one kind of limitation on what can be known. Kant saw another limitation, too: only phenomena—things that can be experienced—are capable of being understood; everything else is unknown. The human senses, therefore, take supreme precedence in determining what is real. These theories have implications for conventional morality. Kant viewed God, freedom, and immortality as incomprehensible: they can only be contemplated; their existence can never be proved. Nonetheless, he argued, all three of them are important as the basis for morality. Kant believed that reason is insufficient to justify moral behavior. The justification for behaving morally has to come from people's sense of duty, which he called the categorical imperative. 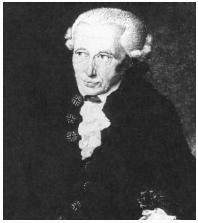 Kant continued to develop his philosophy in subsequent books including Critique of Judgment (1790) and Religion within the Limits of Reasons Alone (1793). The latter enraged the government, resulting in its Censorship and an official order to Kant to write no more books about religion. "The greatest problem for the human species, the solution of which nature compels him to seek, is that of attaining a civil society which can administer justice universally." Philosophers have studied Kant's work for over two centuries, but legal thinkers outside of Europe have only widely treated it in recent years. In the late twentieth century, when many U.S. scholars of law turned to interdisciplinary studies that involved the fields of economics and textual analysis, Kant provided another model for argument. Kant's ideas cover the foundation of law while specifically addressing property, contracts, and criminal punishment. Kant proposed that punishment should be meted out strictly without exception—because of society's duty to seek retribution. "[I]f justice goes," Kant wrote in 1797, "there is no longer any value in men's living on the earth." Fletcher, George P. 1987. "Why Kant." Columbia Law Review 87 (April). Gillroy, John Martin. 2000. Justice & Nature: Kantian Philosophy, Environmental Policy & the Law. Washington, D.C.: Georgetown Univ. Press. Goodrich, Peter. 2001. "Barron's Complaint: A Response to "Feminism, Aestheticism and the Limits of Law." Feminist Legal Studies 9 (August): 149–70. Kant, Immanuel. 1991. "Metaphysical First Principles of the Doctrine of Right." In The Metaphysics of Morals. Translated by Mary Gregor. Cambridge; New York: Cambridge Univ. Press. Tunick, Mark. 1998. Practices and Principles: Approaches to Ethical and Legal Judgment. Princeton, N.J.: Princeton Univ. Press. Waldron, Jeremy. 1996. "Kant's Legal Positivism." Harvard Law Review 109 (May). Wright, R. George. 2002. "Treating Persons as Ends in Themselves; the Legal Implications of a Kantian Principle. University of Richmond Law Review 36, (March): 271–326. Hegel, Georg Wilhelm Friedrich; Jurisprudence. The Kantian reflection on [section] 67 is to demonstrate that the elements of nature, separately in their manifestation do not permit the illation that there is a conformity with objectives, something that can only be hypothetically inferred from nature in its whole as a system according to the rule of the ends (KU, [section] 67, 301), oriented by a subjective aphorism of reason (indemonstrable, then) which says that everything in the world is good for some purpose and that the nature is oriented by a conformity of purposes in its whole. Stang and Pollok in turn focus on the transcendental idealist elements of Kant's theory of matter, which leads to the question: is the essence of Kantian matter that it obeys the form of law? With this conceptualization in hand, Koopman's Kantian link between Habermas and Foucault holds. For its impressive examination of the life-determining moral and ethical dilemmas that we face every day, I strongly recommend Kantian Thinking about Military Ethics. Man and human subjectivity are at the same time the passive object and active subject of a mixed knowledge, which oscillates between the expressive borders of the Kantian age: ontology and positivism, promise and reduction, eschatology and empiricity. El sueno Kantiano: en los limites del "efecto Foucault"
The fourth chapter, "Justificatory Liberalism: Impartiality and Reasonableness," which is the most satisfactory and challenging part, examines Kantian and Neo-Kantian perspectives on interpersonal conflict resolution. The moral development of the Kantian agent, she argues, entails the internalization of proper value judgments in the form of "thick, Aristotelian-style" (58) virtues that support and express these judgments. Panofsky's humanism was interlocked with the Kantian freedom of the judging subject. Together, these criticisms do locate a problem in the project, namely that Hick tends to overstate his basic Kantian distinction. But thereafter the exposition is marred by a somewhat ad hoc invocation of Kantian terminologies and of an inconsistent and hence confusing treatment of the key-term 'worldview'. Flosky as a long-winded fool who has merely substituted his own self-justifying mystifications for a deep scholarly understanding of Kantian thought. The Brave New World--style utilitarian dystopia is a familiar feature of the cultural landscape; Kantian dystopias are harder to come by, perhaps because, until Rawls, Kantian morality presented itself as a primarily personal rather than political program. Does the categorical imperative give rise to a contradiction in the will?